A true sea kayak has a fast hull shape, and not too much hull area in contact with the water ("wetted area"), but it also has reasonable stability. For a man 5 ft 10 in tall, a length of 15 ft 9 in - 18 ft long and a width of 18 in to 23.5 in, which is getting a bit bulky to roll easily. 4) Most kayaks 20-23 inches wide are easy to roll, wide enough to stay comfortably upright in ordinary conditions, but not so wide that they lean over every time a wave comes at them from the side. 5) Every square inch of underwater surface creates drag. Paddling a boat which has too much wetted area is like driving a vehicle with the parking brake half on. The underwater cross-section with the least drag is a semi-circle. That, with a partly-flattened bottom for stability, is the underwater shape of a fast sea kayak. 6) A long boat is fast, but a very long boat is not necessarily faster. A slim ocean racing ski might be 21 ft 4 in long. It would have a considerably higher cruising speed than a sea kayak, but only if paddled by a gorilla who has the power to overcome the drag created by all that wetted surface. Very low initial stability, as in a racing kayak, means that the kayaker can never relax. When stationary, (s)he will have to use the paddle constantly just to stay upright. See Sculling Brace. Sea Kayaker magazine often publishes detailed reviews of kayaks including the subjective opinions of several kayakers and a computer-generated stability table. www.seakayakermag.com. 1) The width of the kayak. A kayak much less than 21 inches wide will be too unstable for an adult male beginner. A kayak much more than 23 inches wide will feel clumsy and will lurch from side to side in rough water. These are total widths, the width where the hull meets the deck. Most kayaks are slightly narrower at the waterline. A sea kayak which is unusually narrow at the waterline is probably suitable only for racing but if it has ordinary total width will become more stable when carrying a heavy load of expedition equipment. The solution is a compromise. The cross-section of most kayak hulls is rounded but with a flattened patch in the middle, say 8 in wide and 6 feet long, to give the boat something to sit on. The bottom of a Greenland kayak is not flat but a flat V. This has low initial stability because the kayak always wants to sit on one side or other of the V, but high secondary stability. So it feels tender, but it's fine when you get used to it. 3) The height and weight of the kayaker. The average man has considerable weight in his shoulders and upper body and needs quite a stable kayak. Unisex kayaks are designed to fit men. The average woman is not only shorter but also has a lower center of gravity relative to her height, so she may feel comfortable in a narrower kayak. See Sea Kayaks To Fit Women. 4) The height of the seat. Racing kayaks and wave skis have seats a half inch or more above those of touring sea kayaks. This makes them unstable by raising the paddler's center of gravity. A high seat also makes a kayak hard to roll. • The potential cruising speed of any non-planing boat is determined by its length at the waterline, not its total length. A waterline length of 14 ft 9 in is long enough for a sea kayak. A traditional sea kayak may be that long at the waterline but have an additional 12 to 28 inches which are almost always out of the water. • A traditional sea kayak is awkward in big steep surf. It can be dangerous for other people in surf because its pointed ends can kebab a swimmer; it is impossible to steer reliably on a steep breaking wave; it often goes towards the beach out of control and sideways; and its front end often digs deep into the water in a "pearl dive". This is because the top of the front deck is more or less flat and horizontal, the front end of the hull is axe-shaped and bites into the water, and the hull often has very little volume at the front. Any large, steep wave approaching a traditional sea kayak from behind lifts up the back of the kayak and tries to force the front underwater. The front of the kayak then acts as a brake, slowing the boat and making it feel very unstable for a few seconds until the wave passes. If the wave is really steep, it may push the front of the kayak so deep underwater that the kayak becomes more or less vertical. In shallow water, the front of the kayak may hit the bottom and be damaged. In slightly deeper water, the kayak may loop end-over-end ("pitchpoling"). This can be fun, but only if you are experienced, close to a nice soft beach, and your kayak is unladen. One possible solution, which has been applied across one manufacturer's range of composite sea kayaks, is to flatten the underwater shape of the hull, especially at the front. It gives the kayak something of the shape of a snow ski and makes for great performance in surf, because the hull lifts out of the water and planes towards the beach at high speed. The flat bow skims over the surface instead of biting into the water, which means that the kayaker retains full control and can make a radical change of direction every couple of seconds if (s)he wants to. There is a price, though. A flattened underwater shape at the bow can give you a noisy, splashy, wet ride on flat water unless the sea is dead calm. At sea, downriver race boats catch the wind and weathercock quite badly, but that doesn't mean the design has nothing to offer. 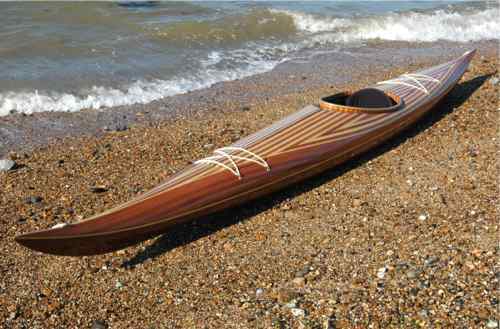 For a light and obedient sea kayak, take a downriver race boat. Cut off the "wings", which are there only to comply with the ICF regulation that a competition kayak must be 60 cm (23.6 in) wide. Keep the total length at 14 ft 9 in. Increase its stability by splitting it vertically from one end to the other and inserting a narrow flat panel to increase its real overall width to 23 in. Split it horizontally to make its profile an inch or so lower. You don't want the bow to be so high it catches the wind or in strong side winds the kayak would constantly try to turn downwind. Add a drop skeg. You now have a boat which weighs much less than a traditional sea kayak, goes faster, is no more affected by crosswinds, will surf on a shallow ocean swell, and in big surf is likely to get all the way to the beach with minimum excitement. At one time quite a lot of general purpose kayaks were like this. From time to time a manufacturer tries a sea kayak of this sort, but kayakers always seem to prefer the traditional shape.